I attended a seminar on writing rules and laying out a rulebook by Hasbro's Mike Gray. Now, obviously, because of whom he works for, his advice was slightly geared towards making a rulebook understandable for the mass market. However, I believe his advice is still generally sound to apply to the Eurogame market. Here are my notes on his all-too-brief lecture. Sadly, I coldn't capture his interesting and funny anecdotes. 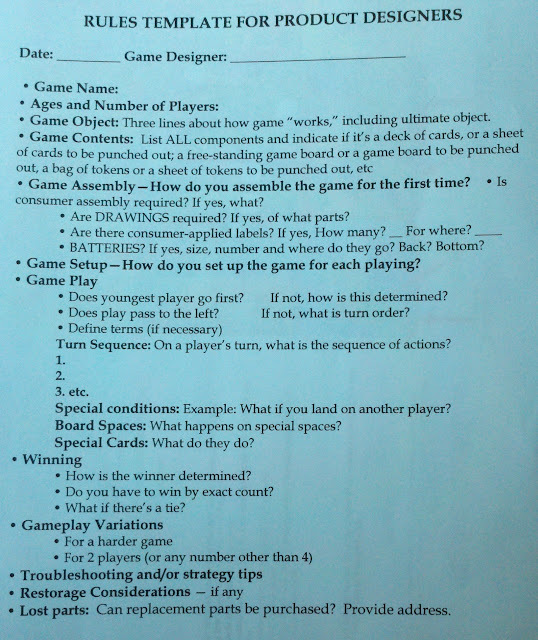 I've also included a scan of the outline he gave us to use in our rulebooks. Don't put a number of players or age on the box if you haven't really tested it. Defining terms cannot go at the end. You have to define them at the start. Don't use "may", "can", "should", "could", etc. if you can avoid it. They are ambiguous and confusing to people. Point-of-view is a problem. Instead of he/she, use "you" and "your opponent". Humor is very important, even in little doses. -does it end immediately or equal turns? for any number other than four players, think about the mathematics of the game. with numbers other than four, player interaction changes. One thing I really like is how Rio Grande often publishes rulebooks with a column on the edge of the page that summarizes the rules. So if you want to know the exact wording of a rule with examples you go to the main body, but there's also a quick sentence there in case you are just refreshing your memory or want it as a reference. Another thing that is important is PICTURES OF THE COMPONENTS! Almost all rulebooks begin with a list of the components involved, and they often use in-game jargon to refer to them. (instead of "20 white cube" they refer to "20 sheep") This is fine, but there should be a picture to help players figure things out the first time they read the rules. Also, don't say things like "many small green discs." Specify an exact number. I've seen rules that do this and it makes it quite difficult to inventory a game for trade, for instance. Examples aren't mentioned either, but I think they're important as they can often clarify things. Navegador provides a quick setup/rules page that is separate from the regular rules, and everyone seems to love that. So there's that too. Anyway. There are a lot of bad rule books out there, I'm glad you are trying to write good ones.